How to grow your hair fast: Experts weigh in on whether it's possible. 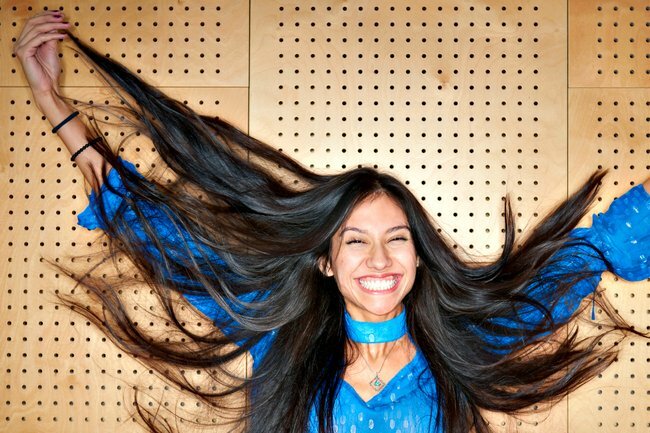 How to grow your hair fast, according to a doctor for your hair. I know this the hard way because my hair and I, we go through cycles. I have it long and wear it up every day, too many school lunches to pack in the morning and zero skill for tonging it into beachy waves. So, I cut it off, usually quite short (I’m currently sporting a poor man’s Jesinta Franklin come Elsa Pataky bleached bob) and love myself sick – for a little while. Then I get… itchy. I convince myself short hair makes me look old/fat/mumsy and I miss my topknot like a phantom limb. I experience physical withdrawals for the feeling of pulling my hair up on top of my head. And so, I begin the painstaking process of growing it back again. Imagine the crescendo of Circle of Life from The Lion King soundtrack here. With my next growth-phase inevitably on the cards (the other day my three-year-old daughter informed me I don’t look like a princess anymore), I recently asked trichologist David Salinger if there is anything you can do to make your hair grow faster. To which he answered; “No.” Oh. That said, there are definitely factors which can influence hair growth to its greatest potential. And avoiding hair loss and breakage is the best place to start. According to Salinger, the typical adult female can expect 1.25cm of hair growth per month. If your hair doesn’t grow as long as it used to, this is due to one of two causes; either your hair isn’t staying in the anagen (growing) phase long enough or your hair is breaking off, says Salinger. How to grow your hair fast. Your hair is made of high-sulphur protein [keratin] and suffers if your protein intake is not adequate enough, says Salinger. Layman’s terms – you gotta eat protein to make it. If you want model hair like Gigi Hadid, focus on including foods that provide the amino acids essential for human health, says naturopath and medical scientist Annalies Corse. “In my clinical experience, the best hair-growth occurs when people consume some animal based foods in their diet,” says Corse. Why? Because animal foods contain the nine essential amino acids our body can’t make. Red meat, poultry and seafood all contain this magic nine, while eggs are a perfect choice for hair growers; They’re a rich source of the sulphur-based proteins you’re trying to make, says Corse. That doesn’t mean vegetarians and vegans are doomed to a life of bobs, lobs and pixie cuts. “Plant-based proteins don’t contain the full set of amino acids we need, but with some good advice or research around healthy food combining on a vegetarian/vegan diet, you can maximise your chances of consuming enough protein,” says Corse. Quinoa, beans and legumes are all high-protein plant foods. Yep. Time for a visit to your GP. “Clinically, the next thing to consider is your hormone profiles,” says Corse. This includes thyroid gland function, adrenal gland function and ovarian function – which can all mess with your hair. And if you’re on the pill, talk to your doctor about alternative brands; “some oral contraceptives can be bad for hair IF you have inherited the genetics for female pattern hair loss,” says Salinger. Ask your GP about pills which are anti-androgenic – which means they block the effects of testosterone (too much testosterone in women causes hair growth on your face and loss on your head). Or, consider another form of contraception and go with the flow…so to speak. “In practice, many doctors and naturopaths are finding women prescribed the oral contraceptive pill for many years can experience side-effects such as hair loss. We are starting to realise the importance of allowing women to cycle naturally to maximise her health in many areas,” says Corse. There’s plenty of styling tricks to help a grower out, says celebrity hairdresser, Anthony Nader. First, not all brushes are created equal. “Invest in a nice cushion brush that has 100 per cent boar bristles, as these babies won’t snap your strands mid-way – especially if you have highly coloured hair,” says Nader. 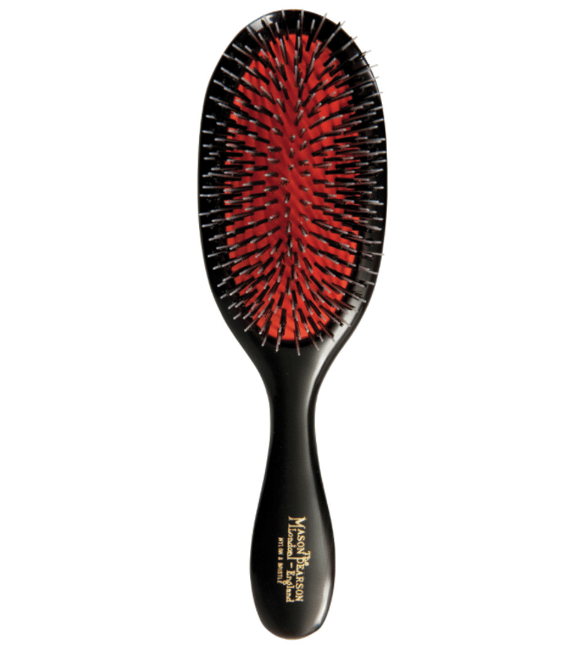 Behold: A Mason Pearson Brush, the Rolls Royce of hairbrushes. Image: Mamamia Shopping. Unlike a hard plastic brush, a boar bristle brush (like this Mason Pearson one) contours to the shape of your scalp and gives it a massage, which stimulates blood flow under the skins top layer. Heat-styling can be done, but make sure your tools are right for the job. “Look out for words on the box or bottle that say Thermal, Heat Protection, Ionic, Bio Ionic, Heat Shield or Ceramic,” says Nader. After all, is there any point having the hair of a Disney princess (or Gigi Hadid) if it looks like it’s screaming for a bloody good cut? 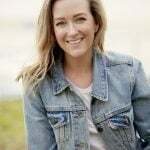 For more info about how to grow your hair fast and getting rid of split ends, get beauty editor of 15 years Leigh Campbell&apos;s advice in your ears with the You Beauty podcast below. How often should you wash your hair? Apparently, we&apos;re all doing it wrong. The only two hair treatments you&apos;ll ever need in your life - which do two very different things.